Whether you're taking an afternoon off to rest your legs, seeking refuge from a spring storm, or looking for a souvenir, there are plenty of reasons to fit a trip to Historic Downtown Truckee into your Lake Tahoe vacation plans. Truckee's shopping corridor is full of unique boutiques selling everything from handmade jewelry to designer denim. We've combed through each one (trust us, this was one assignment we didn't mind!) and come up with our list of Truckee's Top Five Women's Clothing Boutiques. Venture into Ela Chapman and you're guaranteed a warm welcome. The selection of women's clothing and accessories includes brands such as Cupcakes and Cashmere, LA Made, and Veronica M, and feels grown-up and put together without being stuffy or too formal for Truckee's laid back vibe. The selection is constantly being updated, so you'll almost always find something new each time you visit. This is a go to stop for workday staples and cocktail party cool. Established in 2012, Nox offers a beautiful selection of natural fiber, eco-friendly, and sustainable women's clothing. The boutique's owner, Liz Brotz, is dedicated to finding pieces that have a positive impact on both our own health and that of the environment. In addition to the selection of women's pieces, Nox carries USA-made gifts, accessories, shoes and natural beauty products (that smell amazing!). Located on the west end of downtown next to Marty's Cafe, Nox is a must see on your shopping excursion. Across Donner Pass Road from Nox is CA 89. 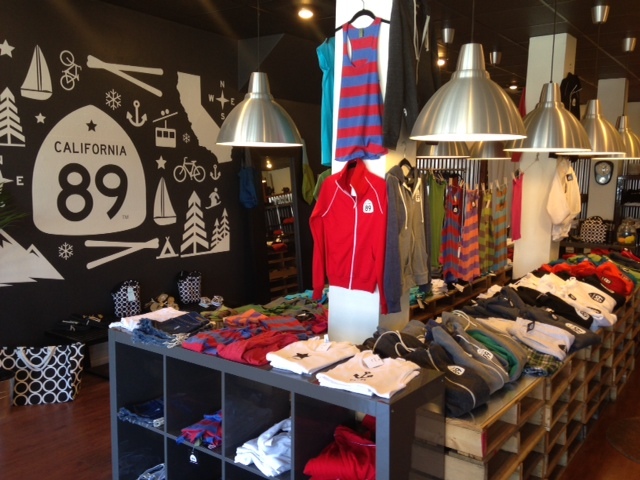 A fresh lifestyle brand, CA 89 has some of the softest hoodies and t-shirts you will ever find. Try one on and you just might not be able to take it off! The boutique also carries a selection of swimwear, hats, pint glasses and stickers, making it the perfect place to pick up a gift for those who weren't able to make the trip to Lake Tahoe themselves. Alli's dream of owning her own shop came true when Nomad opened its doors on October 1, 2015. The darling shop offers everything from dreamy bohemian maxi dresses to edgy moto jackets, all at affordable prices. The boutique also carries shoes, jewelry, and fun gifts. For the latest trends and best prices, Nomad Boutique is the spot! As its name implies, KJB features the best in premium denim, as well as high end brands with a laid back feel. Ready to outfit the "it" girl who can make style look effortless, KJB is a downtown Truckee staple. Whether its a new Frank and Eileen button down, or a perfect pair of Citizen's you're seeking, a trip to KJB is always worthwhile.